You can Set this card from your hand to your Spell & Trap Zone as a Spell. During the End Phase, if this Set card in your Spell & Trap Zone was destroyed by an opponent's card effect and sent to the GY this turn: Special Summon this card. 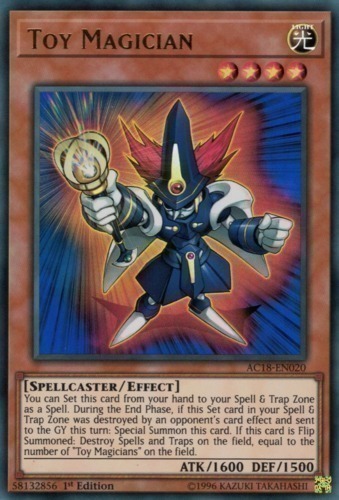 If this card is Flip Summoned: Destroy Spells and Traps on the field, equal to the number of "Toy Magicians" on the field.